Honey is out of town. He went with a professor to Illinois for a staff development gig with a ministry we both used to be a part of. He took off work yesterday at noon and we went on a date! Date nights are pretty much a no-go at this stage, so we improvised. We had a late lunch at PF Changs and this was inside my fortune cookie. Niiice. We went to see the “new” Bond movie before heading home. In our mailbox was a random letter from someone we know in another state with a check included. 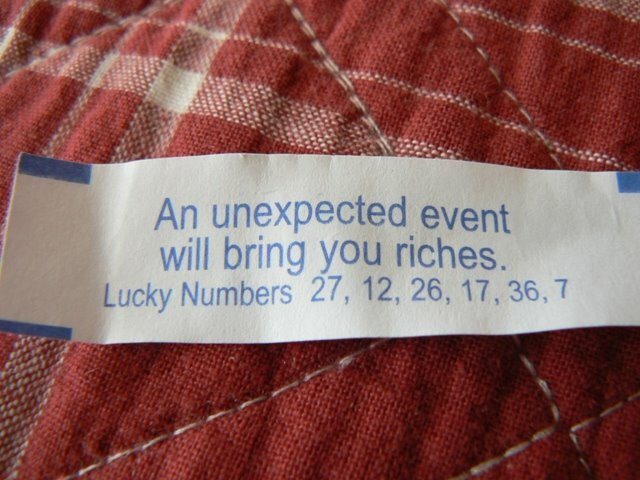 An unexpected event brought us riches. Huh! If this were a movie, the soundtrack would break in with Michael W. Smith singing, “oh the haeeaeeand of Prahvidence. . .” slow fade. You are CRACKIN’ me up!!! And Praise the Lord for the check.